The easiest way to access SQL Server data from Excel and FileMaker Pro. The Actual SQL Server ODBC Driver lets you access your company's Microsoft SQL Server database from within Microsoft Excel or FileMaker Pro. You can connect to any database you are authorized to use, and work with the data just like your Windows-using co-workers. The driver also connects to Sybase databases. This driver installs completely on your Mac nothing is installed on the server itself. Both methods of SQL Server authentication are supported: SQL Server native accounts and trusted domain accounts. There is no special configuration of the database required for you to connect - all you need is a user ID and password. 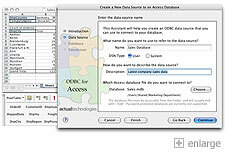 Microsoft Excel has built-in support for ODBC database queries. Use our ODBC driver to connect Excel to your company's SQL Server database. Then you can use the information from the database in your spreadsheet formulas and charts and graphs. The driver includes a setup assistant that will walk you through setting up a connection to your database. On-line help is always available to provide explanations of all parameters. For simple connections, you only need to specify 2 fields! All installation takes place on your Mac - nothing is installed on the server. In addition to local databases, the driver now supports cloud-based solutions. The Microsoft Azure SQL Database is a great way to enjoy the benefits of a scaleable and reliable database with near-zero maintenance. And Amazon Relational Database Service (RDS) provides a fast and easy way to configure multiple SQL Server versions in the cloud. The Actual Technologies ODBC driver makes it easy to connect to both of these great cloud-based databases in just a few clicks. IT support staff typically don't like to install special software on their servers - software that could affect the reliability or performance of a critical resource. That's why our driver resides only on the client Mac, and communicates with the database software that already exists on the server. Our driver supports both methods of SQL Server authentication - SQL Server accounts and trusted domain accounts. This means that no special configuration of the database is needed in order for you to connect. You just need an account, using whatever authentication method your organization has chosen. In addition, anyone who is already familiar with setting up an ODBC connection on Microsoft Windows will be right at home using our setup assistant. Our driver uses the same terminology and we've organized our screens similarly. You can use our driver to access a SQL Server database from your own custom applications - including PHP and REALbasic. Example source code is now available for Carbon, REALbasic, and PHP, and we will soon be providing tutorials and example source code for other languages. Many commercial applications take advantage of ODBC connectivity using this driver.